There were two reasons I’d arrived in Ulverston the afternoon before setting off walking. One was purely practical. It’s a four and a half hour journey from my house to Ulverston. The second was because I quite fancied wandering around Ulverston and seeing the sights. Okay there’s not that many sights, but Ulvertson’s a lovely little town to spend an afternoon in. It’s got a wonderfully old fashioned feel. As I walked to the hostel I was staying in, I walked past back to back terrace houses where washing was hung on lines in the alleyways between them. The town centre seemed to feature a brilliant set of shops – independently owned ironmongers and department stores whose frontages didn’t look like they’d been touched for about fifty years. One building – a former newsagent – even featured a rather old advert for something called Abbey Sauce, clearly lovingly restored. 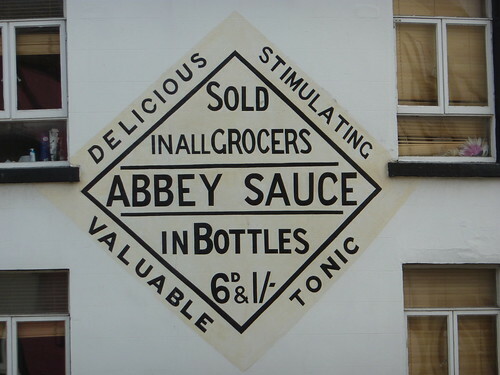 Abbey Sauce may have been a delicious, stimulating, valuable tonic at the price of 6d, but what it tasted like is perhaps lost in the mists of time. Ulverston also has its fair share of famous sons – Sir John Barrow was born locally, and the town was also the birthplace of a certain Stan Laurel. Barrow is commemorated by a monument overlooking the town, which was sadly covered up and under repair on my visit, whilst Laurel features in a rather fine statue near the town hall, with his comedy co-hort, Oliver Hardy. The statue was designed by Graham Ibbeson who has built up rather a reputation for such statues, and is especially well known for his fantastic statue of Eric Morecambe not that far away. 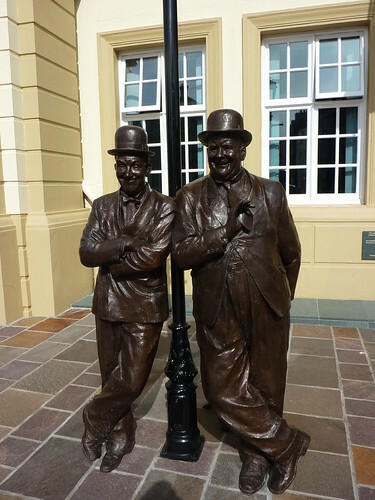 The statue was only unveiled this year, and is cited not far from the Laurel and Hardy museum. It also looked like it would be a very good town for a pub crawl. Although I only visited one pub myself – the Rose and Crown – there were a huge number of worthy pubs to pop into. But what was nicest of all was the peacefulness of it. There seemed a relaxed air about the place. A nice, pleasant little town in which to linger and take your time. To wander down small roads. To admire a well kept town. All my photos from wandering around Ulverston, can be found on Flickr as part of my Cumbria Way photoset. First Published: 31 August 2009. Last Updated: 27 August 2015.